El vocalista Hansi Kürsch da en la web de la banda algunos detalles del álbum orquestal largamente prometido y el nuevo álbum de estudio. "... A lo largo de los últimos 18 meses se han grabado siete canciones en Praga. 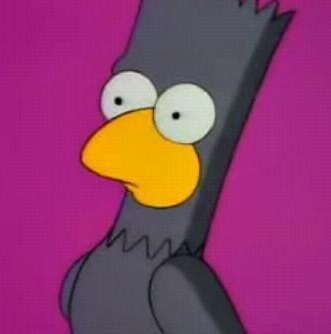 Probablemente un puñado mas de temas se grabará durante este año, y que están finalizados en cuanto a la composición. En teoría, no necesitamos más canciones para este álbum, pero simplemente las ideas parecen fluir sin fin... La razón por la que este álbum está aún lejos de ser lanzado es a causa del disco normal, que nos gustaría publicar sin lugar a dudas en primer lugar. Llegados a este punto estamos en una situación muy difícil. ¿Cómo continuar a partir de aquí? Creo que probablemente es más fácil seguir simplemente por decir algo con el álbum normal ya que este sería el próximo. Tener en cuenta que lo de "próximo" es relativo! " "... Hemos comenzado a trabajar en cuatro canciones y hemos acabado dos. Los títulos con que trabajamos son "Encrypted Time" (creo que este título está inspirado en la pasión de André por World of Warcraft o algo así -. Sólo puedo especular ...) y "The Ocean" (en este caso, André se ha inspirado en mi indefinido murmullo en la canción). "Encrypted Time" es una canción de speed metal moderno con algunos aspectos tribales e inspiraciones de los 70, mientras que "The Ocean" es muy progresiva..."
…first a late, but still fresh, Happy New Year to everyone. After getting rid of some bonus pounds gained over the last few months due to live abstinence we are now getting ready for a very busy and exciting year of creativity and efficiency. Wishful thinking, you think? Blasphemy, I would reply! As most of you may have recognized, we have been busy all during 2012 with some additional touring activity and some extra missions, such as the completion of A Traveler’s Guide to Space and Time, which is a great legacy. It features all of our material from the Virgin era in a new and accurate framework, beautifully designed by Felipe Machado. The whole box offers a great insight about that particular part of our career. Even though it took us more time than expected, we are really pleased with the final result. It’s something we are really proud of and something which you hopefully are going to enjoy as much as we do. I just got my sample yesterday, and am really blown away. This, of course, has not been the only thing we were doing during the last year. For the sake of fun and leisure we were working on new stuff and progressed far quicker than we would have expected. Not that this means a lot in the generous production time frame of Blind Guardian. But it might secure a late 2014 release for at least one BG album. As you may have read in interviews we are intending to bring a long story to a well deserved and hopefully happy end. As already announced with A Twist in the Myth and also with At the Edge of Time, apart from a regular album there finally will also be the release of the orchestral album. Why am I so sure about not being wrong again this time? I have no idea. Nothing new here, one could say. The difference might be that throughout the last 18 months we have recorded 7 songs in Prague. There probably is a handful of additional songs to record during this year, but they are also already finalized with regard to composition. In theory we do not need any further songs for this album but ideas simply seem to flow endlessly… The reason why this album is still far from being released is partly based on the regular album, which we definitely would like to release first. At this point in time I am in a very tricky situation. How to continue from here? I think it is probably easiest to simply continue by telling you something about the regular album since this would be next anyway. Keep in mind that “next” is relative! Well, we have started working on four songs and already were able to finish two songs musically. The working titles are “Encrypted Time” (I think this title is inspired by André’s passion for World of Warcraft or so – I can only guess…) and “The Ocean” (here, André has been inspired by my undefined mumbling in the song). “Encrypted Time” is a modern speed metal song with some tribal aspects and some 70′s inspirations, while “The Ocean” is a very progressive (this time I talk about ELP meets Savatage art rock when I say progressive) orchestra dominated song which will give you a further glimpse of what to expect from the orchestral album. I am clueless about the right story board for “Encrypted Time” but “The Ocean” could be used as a theme opener for the orchestral project. We will see… The other four songs seem to turn out very special and obviously very different. Working titles: “The Irish Hill”, “Prophecies”, “Soundtrack 2″ and “Midtempo Song”. I cannot tell you exactly about how many times we have had a song over the years which was first called “Midtempo Song”. I am pretty sure we are not the only band abusing this spectacular title over and over again. Thank God, the title is not copyright protected, yet. We would be in trouble then. Maybe it is and that’s the reason why it barely ever ended up as a title on the album. Out of those tracks “Prophecies” is the one which is developed the most. It is almost straight forward, has a very strong pre and main chorus and offers some “Queensrÿchish” prog (this time I do mean Queensrÿche when I say prog) elements in combination with some Blind Guardian fantasy metal. A nice one. I’ll keep it short from here: “Irish Hills” might be a surprise with some Irish melodies, which none would expect in a song with such a name… “Midtempo Song” is a great song of misunderstandings and technical failures, the result so far is a little surprising to everyone involved and has nothing to do at all with a song entitled “Midtempo Song”. I enjoy this one a lot, because I cannot remember us doing something like this. The song is still in a very early phase and André has kept it hidden from me for a while now. “Soundtrack 2″ has been the first song fragment for the new album. We had put that aside for a while, but it contains some very heavy elements, almost thrash metal like. Let’s see how this is going to end up. You see, there is a lot in the pipeline already. But there certainly will be more new stuff during the year. Even though we have already started to record some drums for the album at the end of the last year, the whole thing is going to keep us busy until the spring/summer of 2014 for sure. Básicamente en la extensa nota de su web Hansi Kürsch comenta que están trabajando en un nuevo disco y que esperan finalizar la producción en mayo. "...anunciamos en secreto la terminación de la producción del álbum para finales de mayo. Obviamente hemos progresado rápidamente, en términos de Blind Guardian. De hecho, todo se ve muy prometedor en lo que respecta a la composición y producción. Tenemos buenas razones para creer que el álbum va a estar completamente terminado en ese punto... "
Like the majority of you, I was also very surprised when our show in Geiselwind was announced for May 2014. I suppose that I, or one of the other guys, have agreed to this show. I’ll probably never figure out who did it, but that’s not important now, the show itself is of importance. To be honest, all of us cannot wait to get back on stage. Our stage abstinence seems much longer to us than “just” 2 years. Since we were asked to do a “Best Of” show we do not even have to rehearse, this is more or less the type of show we have done in the past anyway. I still hope we can put in some surprises since no one really knows what we consider our “Best Of” songs at the moment. It might differ from Memories of a Time to Come though. Right now I’m working on a possible set list and I’ll cross my fingers that this will be approved when the others have a look at it. By announcing this live appearance we also secretly announced the intended termination of our album production for the end of May. We obviously have progressed quickly, in Blind Guardian terms that is. Indeed, everything looks very promising with regards to our songwriting and our production. We have good reasons to believe that the album is going to be completely finished at that point. Let’s hope I will not be proven to be the reincarnation of good old Münchhausen again. Anyway, even the worst case scenario would have us not being too far away from completion at that point. Since we have already completed several production steps on the new album the picture gets clearer and clearer. Although not necessarily clear enough to decide whether I’ll go lyrically for individual topics on each separate song or instead for a conceptual album. On one hand the concept would have a strong fantasy link and on the other hand it would contain some typical Dystopian elements, because this is also what I musically find in most of the songs. 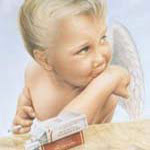 They will all feature an almost magical grandeur but will present some very harsh disturbing elements as well. Therefore such a concept might be very suitable. I will have to sleep on it for a while until I’m able to make a decision. Whenever we start songwriting I try to create a plan in my mind detailing which qualities I would love to feature on the next BG album and what general impression I would like to create. Very often at the end things come out quite different and I’m surprised which qualities or preferences have shown up then. This time there seems to be a collective urge (without even having talked about it) among all members to feature the more aggressive side of Blind Guardian this time. Right now, we are working on 5 faster songs. As far as I remember last time I have mentioned “Encrypted Time” and “Holy Grail” (which are both proceeding well in the album production), so I am going tell you a little bit about “Winter’s Coming”, “Outcast” and “Song 9″. The first one is based on Marcus’ idea of a 90′s orientated speed/thrash song. We have finished a good two thirds of this one. It’s fast and heavy, or was it heavy and fast? I have no idea how he came up with the title “Winter’s Coming”… “Song 9″ is a fresh one which used to be a collection of parts at first, but then developed into something very special. I would describe it as a refreshing combat between “Guardian of the Blind”, “The Script for My Requiem” and “Ride into Obsession” only disturbed by a fairly straightforward chorus. If you ask me this one is born to become a “classic, but first underrated by the band” song. My favorite among the fast ones certainly would be “Outcast”. A song full of surprises. The old school die hard fan will probably complain later that this one has a soft intro (epic and sad), but even this person would have to agree that afterwards we keep up the speed on this one to the very end. The song is a roller coaster ride through the last three decades of metal. I love it! “Midtempo Song” is the most “commercial” song on the album so far. “Commercial” in a positive way, of course. It would deserve a title like “Irish Hills” more than “Grand Parade” did when it was called “Irish Hills”, but who said that life is always fair… To give justice to the song I also have to say that it is very progressive but also very catchy. “The Throne” is another epic piece we are working on. I have just started working on vocals for this one last Friday. It is too early for me to describe this one more precisely. What I can say is that this one is the perfect link between “Grand Parade” and “The Ocean”. This last one is already completely recorded except for the vocals. “Prophecies” and “Encrypted Time” are completely recorded and the same can be said about some older B-songs, which we have decided to finalize with this session as well. The BG pundit knows about which songs I am talking. The songwriting period is almost finished by now and the final production session is going to start next week and will keep us busy until Geiselwind. As I think about that I better stop thinking and start songwriting instead. Ya ves yo ayer por la noche, directamente desistí, además no dice gran cosa. Que van a dar un concierto especial y varios títulos de nuevos temas, además de que van a hacer 5 con caña . “Twilight of the Gods” será lanzado el 05 de diciembre de 2014 por Nuclear Blast. Hansi Kürsch asegura: "esta canción es una declaración acerca de Blind Guardian. La definición pura de todo lo que la banda significa: es innovadora, melódica y brutal" Y por lo tanto una opción perfecta para conseguir de los fans el estado de ánimo adecuado para el próximo álbum. “Twilight of the Gods” es una "rompe cuellos" en la más autentica tradición de Blind Guardian "que te cautivará con el coro más épico y pegadizo que he escrito", dice Kürsch. “Twilight of the Gods”, the first creation of the Krefeld, Germany based band in more than four years will be released on December 5, 2014 via Nuclear Blast. Blind Guardian vocalist Hansi Kürsch assures, “this song is a statement about Blind Guardian. The pure definition of all that the band stands for: it is innovative, melodic and brutal.” And thus a perfect choice to get fans into the proper mood for the upcoming album. “Twilight of the Gods” is a “neck breaker” in the true tradition of Blind Guardian “that will captivate you with the most epic and catchy chorus we’ve ever written,” says Kürsch. 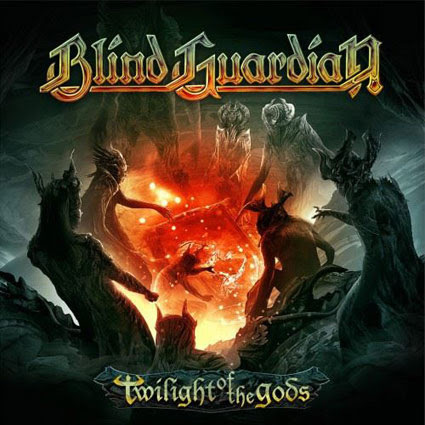 In “Twilight of the Gods” Blind Guardian is singing about the deities’ waning power; no such times are in sight for the band. Blind Guardian is back with a vengeance; with an impressive single from an overwhelming record! BLIND GUARDIAN han titulado su décimo álbum de estudio "Beyond The Red Mirror", y saldrá en Europa el 30 de enero 2015 y el 03 de febrero 2015 en América del Norte a través de Nuclear Blast. Fue grabado en los estudios "Twilight Hall" en Grefrath, Alemania y fue producido por Charlie Bauerfeind (SAXON, HAMMERFALL, HELLOWEEN). BLIND GUARDIAN trabajó para este disco con tres coros clásicos diferentes: uno de la República Checa (Praga) , uno de Hungría (Budapest), y uno de los Estados Unidos (Boston) y dos grandes orquestas - cada una con 90 músicos -. Las portadas son obra de Felipe Machado. “La historia comienza con nuestro disco, Imaginations from the Other Side de 1995. Los dos mundos descritos en el mismo han cambiado drásticamente para peor, desde entonces. Mientras que solía haber varios pasos entre los mundos, ahora sólo hay una puerta: El Espejo Rojo. Hay que encontrarla a toda costa”. 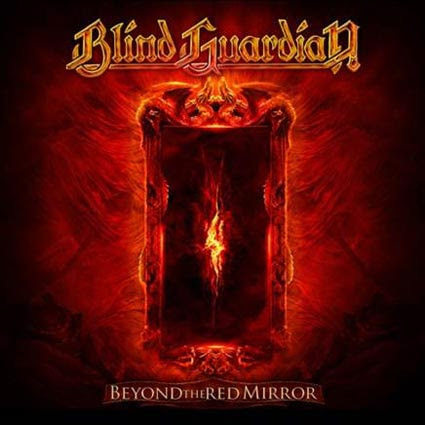 2014-11-07 18:00 - »Beyond The Red Mirror« will be the title of the highly-anticipated tenth studio album by Germany’s favorite sons and metal’s most epic storytellers BLIND GUARDIAN. Prepare to have your senses overwhelmed. Four-and-a-half years in the making, the follow-up to 2010’s »At The Edge Of Time« (which debuted at #2 on the German album charts and at #1 on the American Billboard Heatseekers chart & #108 on the American Billboard Top 200 Albums chart) is scheduled for release in Europe on January 30th, 2015 and February 3rd, 2015 in North America. Recorded at Twilight Hall Studio in Grefrath, Germany and produced by Charlie Bauerfeind (SAXON, HAMMERFALL, HELLOWEEN), »Beyond The Red Mirror« showcases BLIND GUARDIAN’s long-awaited collaborative work with three different classical choirs: one from the Czech Republic (Prague), one from Hungary (Budapest), and one from the United States (Boston). Two grand orchestras - each featuring 90 musicians – also lend their brilliant talents to the new recordings with absolutely spellbinding results. Transporting listeners via a mysteriously powerful red mirror into an otherworldly dimension that includes tyrants, gods, and the Holy Grail, the ten songs comprising »Beyond The Red Mirror«’s story lines revolve around the young protagonist we first met twenty years ago in the 1995 tracks 'Bright Eyes' and 'And The Story Ends'. Opening with a tidal wave of surging emotion courtesy of a spine-tingling choir »Beyond The Red Mirror« unleashes its first gem, 'Ninth Wave', a consciousness-expanding palette of landscapes and moods bearing the message of an urgent mission still seeking resolution. Closing with an explosion of heroic harmonies & choral glories with a nine-and-a-half minute, self-contained saga 'Grand Parade' (called “the best song we have ever written” by Olbrich), the grandiose, uplifting, and ingenious storytelling in »Beyond The Red Mirror« is guaranteed to leave you breathless. Come 2015, you will soon experience why BLIND GUARDIAN are so influential in their genre and without equal in the pantheon of heavy metal music. Featuring artwork by long-time collaborator Felipe Machado. Tengo ganas de oírlo ya! !